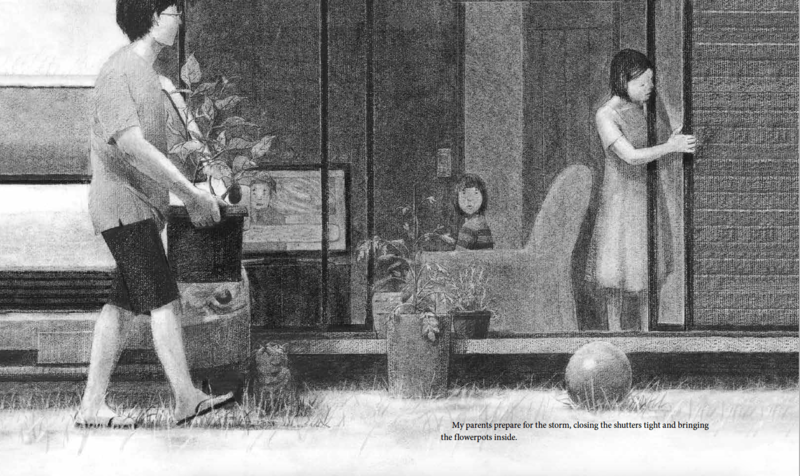 That’s right—today I’m sharing Akiko Miyakoshi’s picture book life! She’s had three picture books published as author-illustrator in English so far, and I’m looking forward to more! Her work is absolutely infused with imagination and her charcoal and pencil drawings allow her to alternate beautifully between spare and substantial, depending on the tone of the moment she’s portraying. Miyakoshi’s work is infused with stillness, curiosity, connection, comfort, hope, imagination, and a little bit of magic. Her books, for me, quietly captivate and make the world slow down. The Tea Party in the Woods (2015). This one feels like a fairy tale without the scary bits. 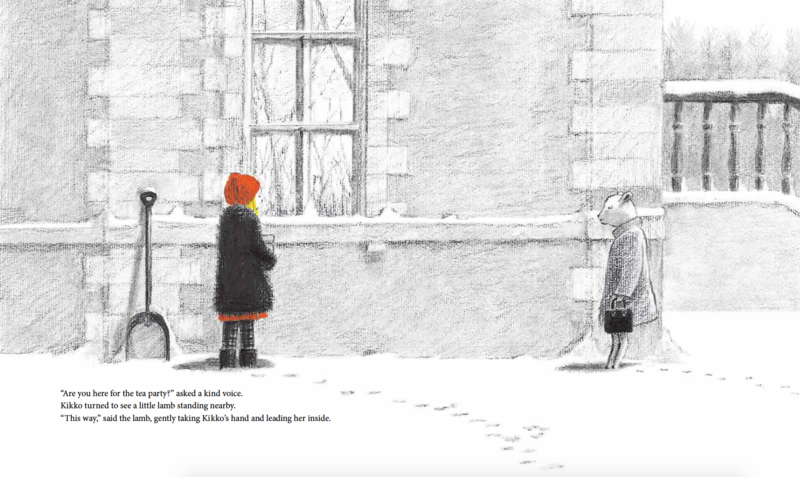 A girl in a red cap, a pie, a grandmother, a bear. 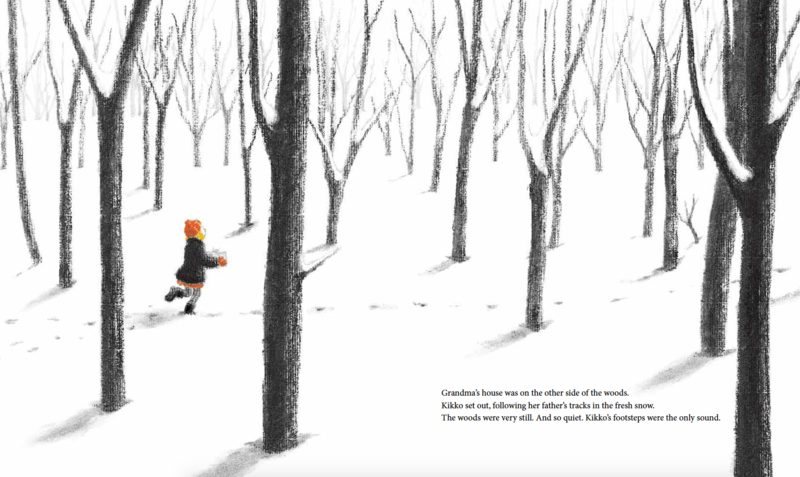 When her father forgets the pie he’s bringing to Kikko’s grandmother, Kikko sets off to find him. She thinks she’s following his footsteps, but instead she’s led to an unfamiliar house in the woods. But no scary bits here, remember? The figure in the coat and hat Kikko followed was actually a bear, the house the setting for a wonderful tea party with other forest animals and pie. Instead of the woods being a place to fear, this story portrays it as a place of wonderful surprises and generous, welcoming spirits. 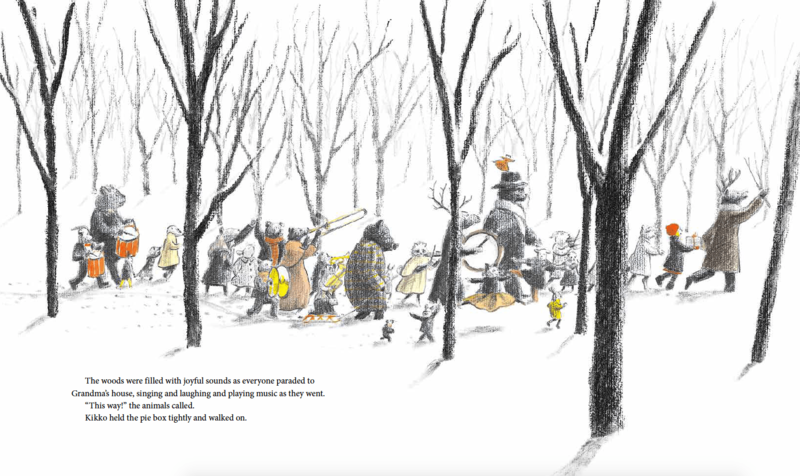 While the woods were once empty, full of white space and leafless tress, the animals fill it in a sort of parade. Her use of color is so effective too, little spots of brightness and then that sweet, colorful pie. The illustrations convey the feeling that though the world may seem lonely, it’s full of wonder and community and magic. And the details make it feel truly real. This book has surprise and joy and fond feelings shared by all kinds of creatures. 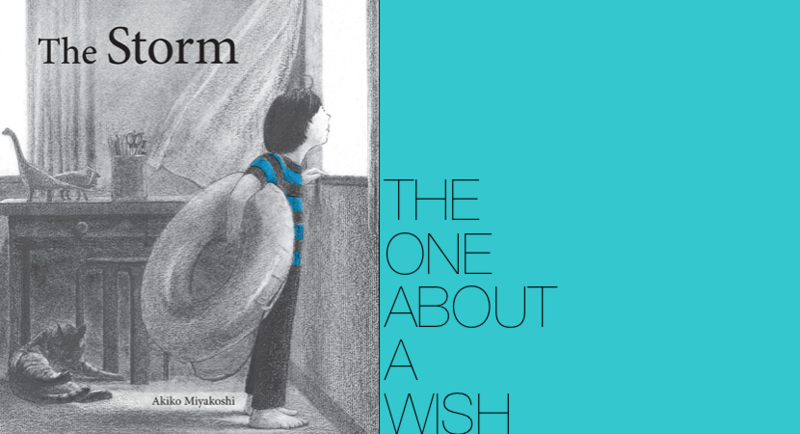 And, it’s a story that affirms a child’s imagination, something I’m always a fan of and something Akiko Miyakoshi does exceptionally well. A boy planning a beach day with his family worries the coming storm will cancel his trip. There is fear in this story, fear of weather and fear of having joyful plans disrupted. The black and white drawings add to the ominous feelings of worry. After wishing for a ship to conquer the storm, that night he dreams of one, and he is at the helm. Here too, a child’s imagination is a powerful, palpable thing and the next day, the storm is gone. 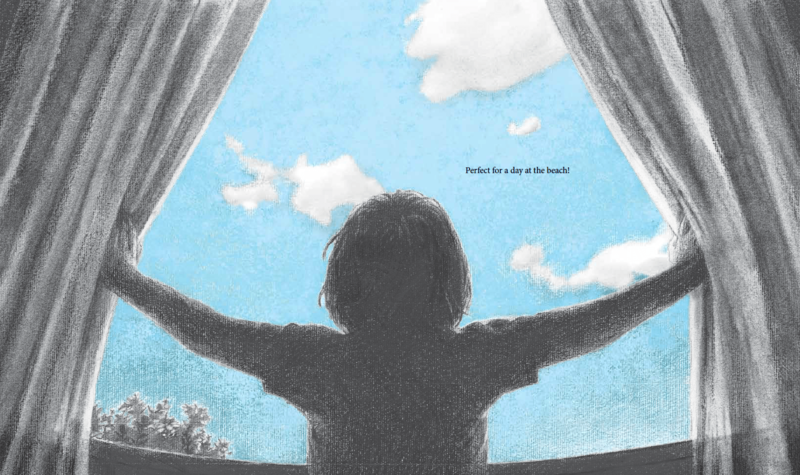 Finally, the lift and break and joy of brilliantly light blue skies that match the remaining puddles from the rain, a child’s wish fulfilled telling readers that despite the darkness of worry, there is hope. Despite fear, there is courage. The Way Home in the Night (2017). 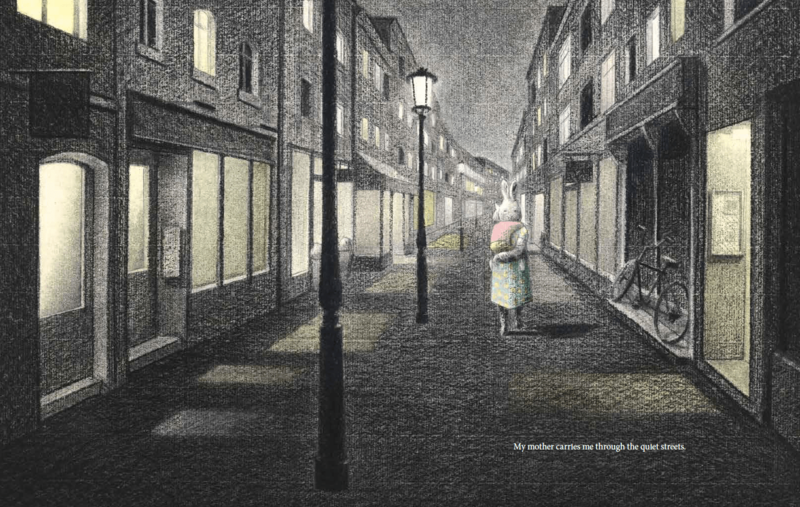 The bunny in this book is walking home with their mother, looking at the windows they pass. 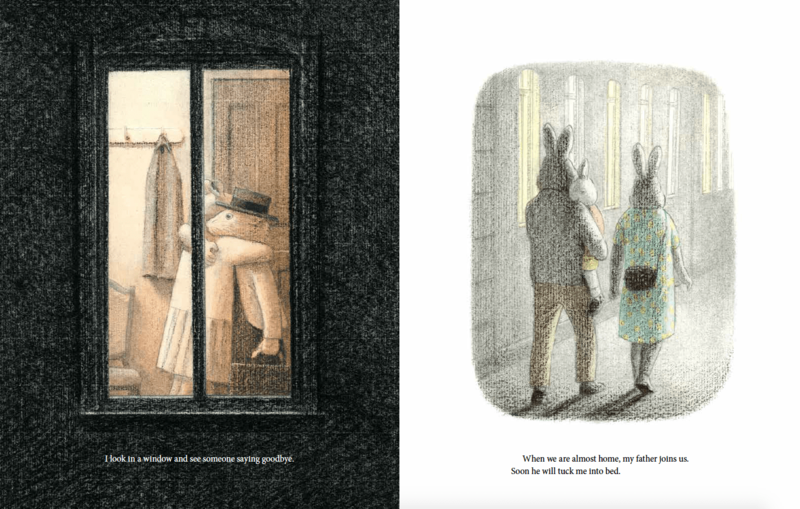 Once again, this story captures imagination and wonder so effectively as bunny imagines what each neighbor might be doing inside their home. Bunny pictures these domestic scenes, each rendered simply, yet with so much resonance. We glimpse each character through Bunny’s wonderings, each evening they’re having in that tender, liminal time of night before going to bed. 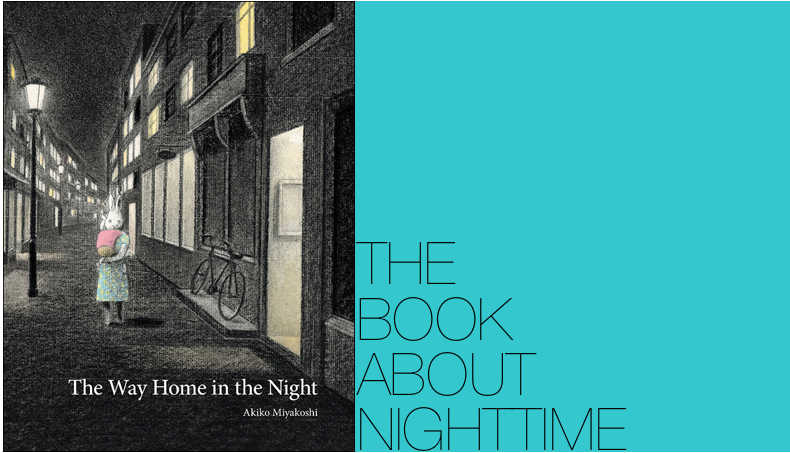 The yellow glow in this picture book about night is one special thing about it. It’s dark, it’s night, but it’s always comforting, illuminated. Perhaps there is a comfort in imagining others around us even when we can’t see them. If we can envision the experience of others, then we know we are all the same under the same moon in the same dark and glow of evening. 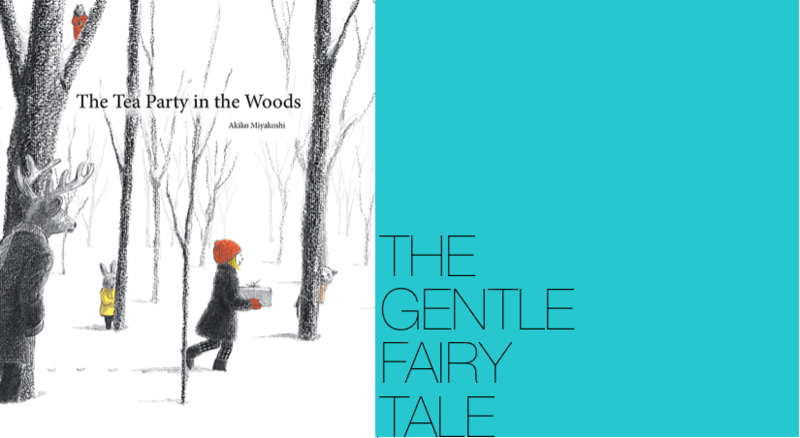 Enter to win one copy of all three of Akiko Miyakoshi’s picture books from Kids Can Press! Big thanks to Kids Can Press for interior images and the generous giveaway! You might also be interested in ISOL’s picture book life. We have checked out two of the three books from our library and we love them! They are absolutely stunning! Oh I love these!! I’ve read Tea Party in the Woods to my kids before from the library. Thanks for the chance! I think the charcoal technique somehow adds to the dreaminess of these. 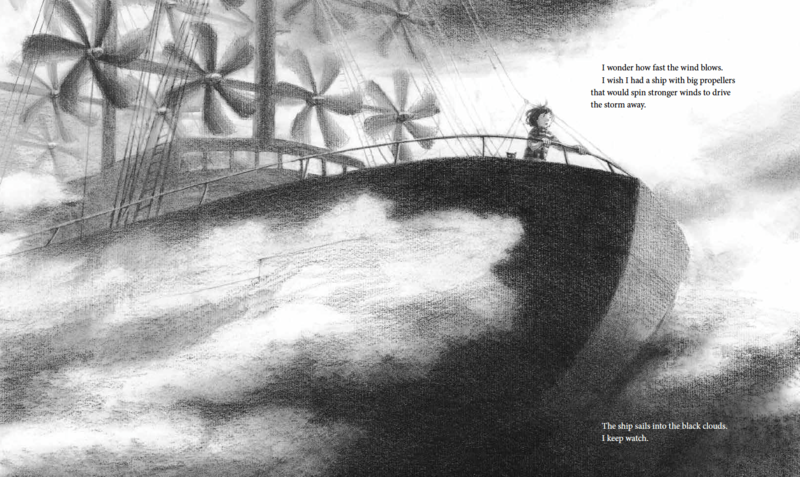 Dreamy is a perfect adjective for her stories and illustrations! 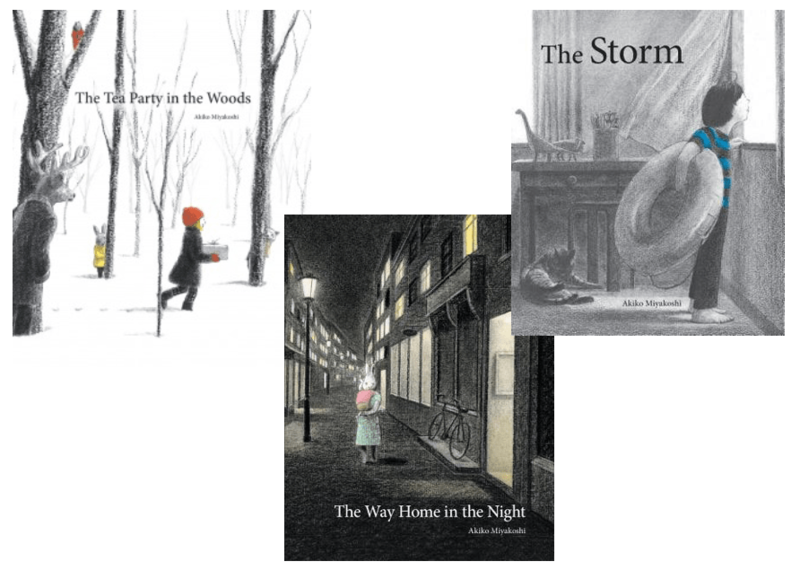 These are beautiful, and what a wonderful author illustrator to feature; would love to add them to our home library! The books look beautiful! Thanks, Danielle, for highlighting Akiko’s books. It’s my pleasure—her work is some of my very very favorite out there. Gorgeous! Going to look for them now. Akiko’s books are fantastic. I have not seen the Way Home book, but love the others. There is so much emotion in her work. These books bless the reader and we look forward to future books! Many more! As a tea drinker I was drawn to The Tea Party in the Woods. Luckily my children like it too. The Storm looks like a great summer book when we all wish to go to the beach every day. Finally, the Way Home in the Night is appealing because of the rabbits. I like rabbits. Also, children’s book about positive aspects of the night are rare. Yes, it’s interesting how her books are sort of subtly seasonal in nature. 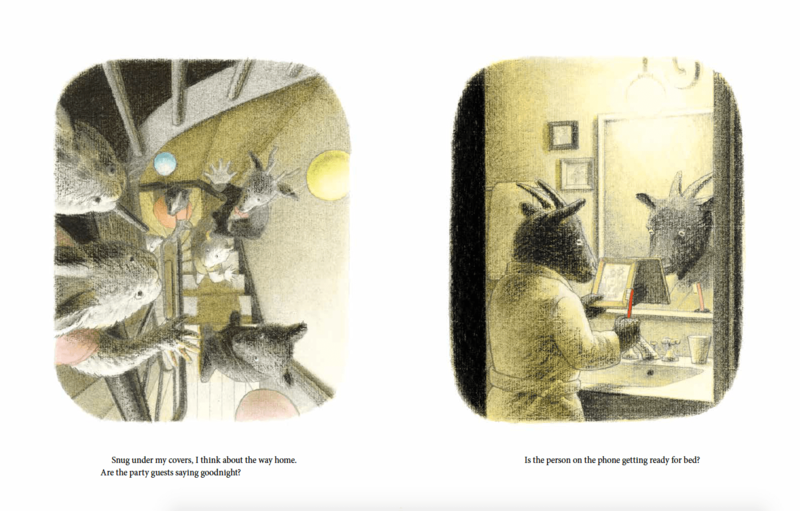 And yes, night as a comforting time is so nice to see in a children’s book. The simplicity, the silent messages puts me in awe. I’m inspired. Yes! Same for me—so inspiring. These books are so lovely! I’ll have to see if I can find them at my library. 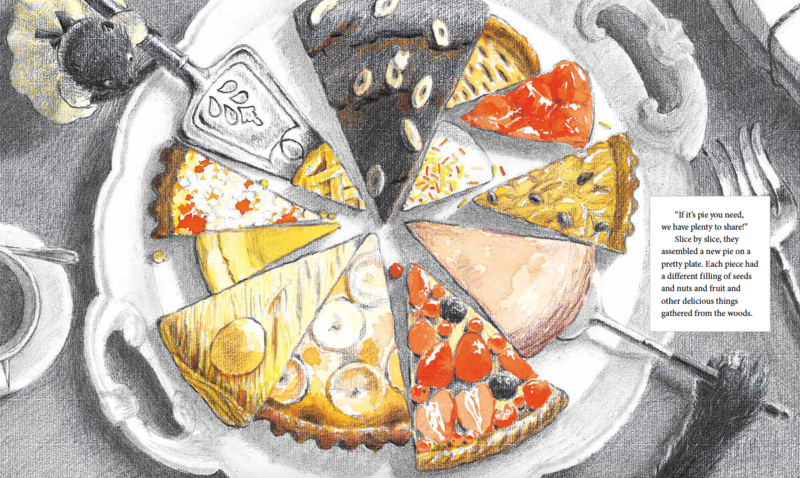 I think the illustration of the different pie slices is my favorite! That’s one of my fave illustrations too! All her work is kind of my favorite. She’s up to something special. Love this! Her books are indeed magical! We’ve only had them from the library, so crossing my fingers and toes! Wonderful blog. Fabulous books that you are suggesting. I will have to look for a copy of Tea Party in the Woods. A gentle fairy tale sounds perfect for my tender-hearted 8YO. Her charcoal and pencil drawings beautifully illustrate the mood. I would love to have these books. I think that The Way Home in the Night would be my favorite. We have a winner, and it’s Raymond! Giveaway now closed.